David Bowie and the Spiders were my first heroes. The first gig I ever went to was when me and Julie went to see them play at Leeds Rolarena on June 29th 1973 – the last gig before Ziggy died at Hammersmith Odeon. I was blown away by the gig, and that was it, I wanted to be in a band. So my first ‘band’ was just me & Julie. We were called The Weirdies in the Wardrobe. I played ‘drums’ on my mum’s place mats (pictures of roses on them). Someone told us David Bowie’s address so we wrote to him, and couldn’t believe it when Angie Bowie wrote a hand written letter back. Angie said in her letter ‘Good luck with the Weirdies in the Wardrobe, lovely name for a band’. We got the seal of approval from the Bowie family – this was the most exciting day of my life! The Spiders were amazing, Trevor on bass, Woody on the kit. Mick Ronson was stunning and they were hugely influential to my whole life. I moved to Hull a few years later and I nearly got to meet Ronno. We were recording at Fairview Studio and he was coming in to check it out, with a view to recording a band called One the Juggler there. I was dead excited, I was finally going to meet my main man, but had been recording all night and was a mess, so I rushed home to wash my hair. Needless to say, when I got back I had missed him. Serves me right I suppose. Not long after the first gig we went to see Mott the Hoople at Leeds Town Hall, and Queen were supporting them. 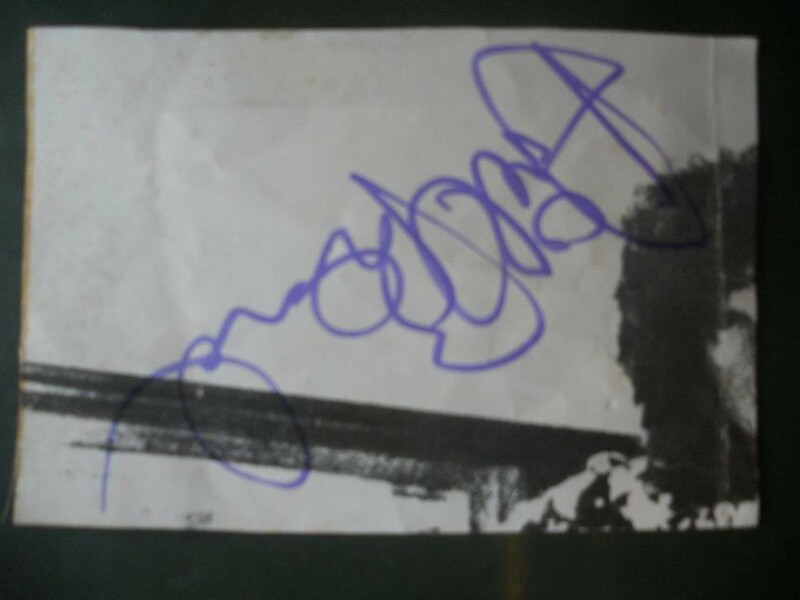 I got Ariel Bender’s autograph on a picture of Brian May’s hair. Mott were awesome and I read Ian Hunter’s book Diary of a Rock & Roll Star over and over again. Here’s another David Bowie related story. One day, when I was playing with The Planet Wilson I got a telegram (Sam) from the manager of a band called Thrashing Doves saying their bassist had left and would I be interested in joining them. I thought about it, but said no, because I was a Planet Wilson girl right then. Anyway, the bass player who had left was Gail Ann Dorsey who played with David Bowie for years. Ahhh…. Ziggy at Leeds ad and my bus ticket. The computer tapes say DAvid Bowie and Mott the Hoople. I made them on a school trip to Leeds Uni. You can listen the story of the letter here on BBC’s People’s History of Pop. So thanks to all this I had lots of fun playing in bands, and still do. Rich and I sometimes play a song I wrote about it. We’ve not recorded it, but here’s something – My Fantastic Past (Letters from Starman). To bring the story full circle, I was so chuffed when the comment below from Phil John – about our new band Loudhailer Electric Company turned up on this page. Phil is *the *’Phil’ from Mott’s road crew in Diary of a Rock n Roll Star, and also was the spotlight operator on the Ziggy tour in ’73, that very first gig which shaped my life. He loves our album, I am made up! Thank you so much for your Loudhailer Electric Company CD. I played it through 9 times today and really enjoyed it.I had a feeling that I might after seeing the great cover design. I hope I don’t offend you by saying that it in many ways brings memories of the 60’s & early 70’s flooding back though I wouldn’t imagine that you guys are old enough to have been around then. Would I be right in thinking that your influences might include Patti Smith, Fairport Convention possibly The Byrds even a bit of Led Zeppelin? Some really good guitar and I always like violin. My friend who was listening with me is an ex drummer and was also impressed. Your vocal style does remind me of Patti Smith on some numbers Grace Slick on others. Two of my favourite female singers. Once again thanks for sharing your music with me and let me know if you get any gigs down south. Ps . Diaries on the way, don’t expect too much it’s only a tour diary written 43 years ago with no thought of publication.